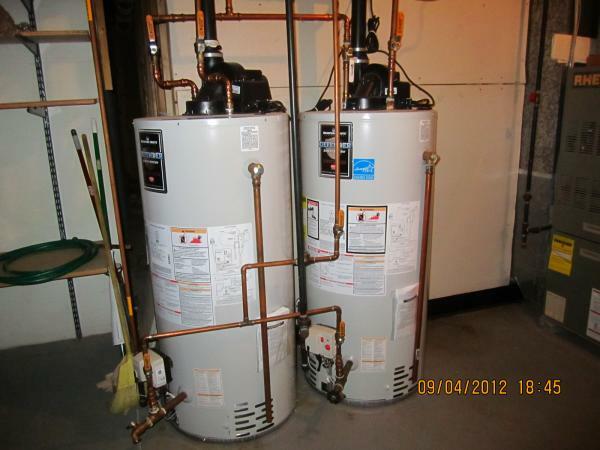 Every apartment, condo, house, and business that produces hot water has a water heater unit. The water heater’s responsibility is to create storable and deliverable hot water. The thermodynamic process uses an energy source, such as electricity, gas, or solar in order to heat water. This hot water can then be accessed in the plumbing system via sinks, washing machines, dishwashers, showers, and bathtubs. Typically, a storage tank water heater is found in domestic settings. The storage tank allows for the water heater to effectively deliver hot water instantly to the source. The storage tank also allows for hot water storage in the event of a power outage. This allows for important hot water delivery during times of crisis and emergency. Simply put, a tank-less water heater does not have a tank. Tank-less water heaters are high-powered machines that heat water as it passes through the device. A building may actually have multiple tank-less water heaters installed in order to ensure hot water can be delivered to all points of the building. The downside is that these devices do not store heated water to be used during a power outage. Water heaters are typically powered in one of three ways. Fossil fuels, such as natural gas and propane, are the most commonly used energy source. Electric water heaters use two electronic resistance points, top and bottom, to heat water. Solar powered water heaters are the least common, but are gaining popularity. Solar panels can be an expensive investment, and can be well worth it in the future. For storage tank water heaters, the appropriate size needed depends on how many people the water heater is supposed to serve. A small water heater is between 50 and 60 gallons, and can support between 1 and 3 people. A medium water heater is around 80 gallons, and works well to support 4 people. A large water heater is over 100 gallons, and is appropriate to support up to 6 people. Maintaining a hot water heater is simple and necessary. First, the pressure valve should be checked often to ensure pressure levels stay in the safe zone. Water heaters should also be flushed every now and again to make sure the water lines do not get clogged. It is recommended that the water heater be changed after 10 years of use. Newer models are more efficient, and can significantly reduce energy costs. The following statistics are according to the United States federal government’s energy website www.energy.gov. The average shower uses approximately 10 gallons of hot water. The average dishwasher machine uses 6 gallons of hot water per cycle. The average hand dish washing or food prep uses 4 gallons of hot water. Finally, the average clothing washing machine uses 7 gallons of hot water. Regularly maintaining your water heater units will ensure efficiency and longevity.